For HVAC Installation and construction work Toomey Rents carries a Genie Lift model SLC-18. Which is capable of lifting loads of up to 650lbs. 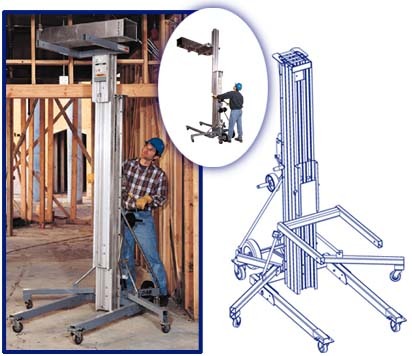 This lift machine can be operated by one person but typically requires 3- 4 for loading and unloading purposes. The extendable boom can lift from about 4" off the ground up to 18' and is great for installing or removing HVAC units or air vents. Due to the size and weight of this machine a full size pickup truck, cargo van, or box truck is required for transporting. For exact dimensions and specifications please give us a call.